The Packard Plant bridge over East Grand Boulevard in Detroit collapsed around 3 p.m. Wednesday. 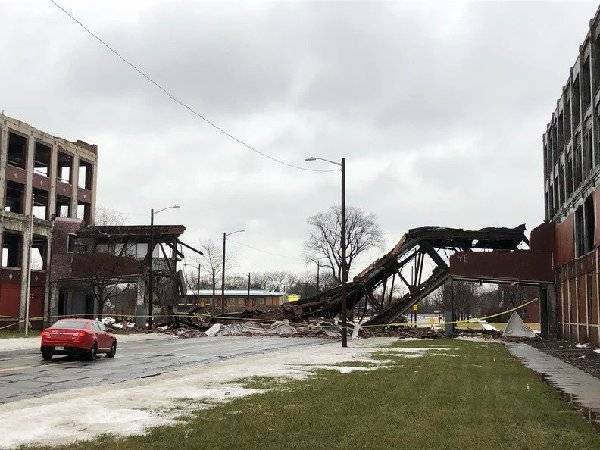 Joseph Kopietz, a member of Detroit-based Clark Hill's real estate group representing the 3.5 million-square-foot plant's owner, confirmed the collapse to Crain's Wednesday afternoon. Earlier Wednesday, according to Kopietz, some on-site construction crews reported bricks were falling from the bridge that crosses Grand Boulevard as part of the sprawling, blighted factory campus on Detroit's east side. My biggest fear is that when I die, my wife will sell all my "toys" at the price I told her I paid for them. 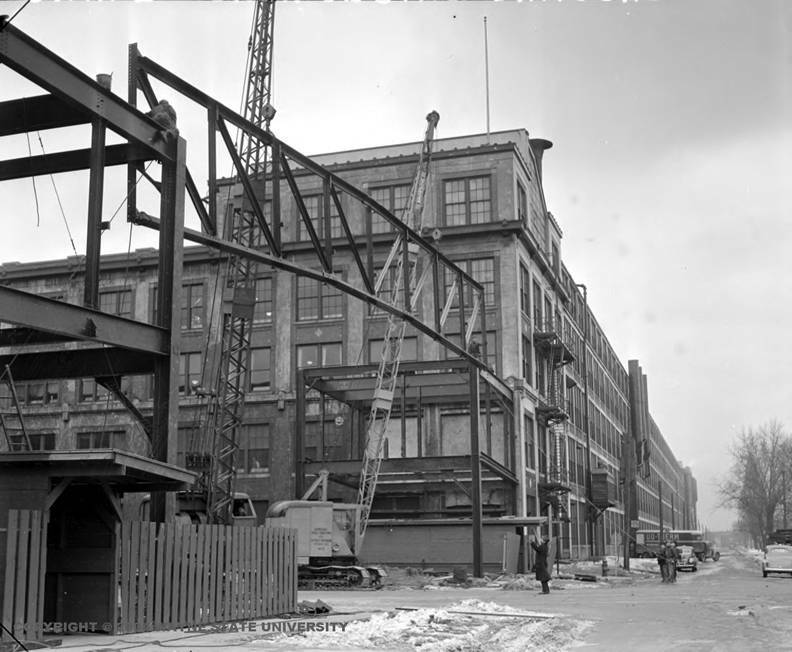 I have no words, but here are two photos from Wayne State University, showing the bridge on March 1, 1939 while under construction, and on August 15, 1956. To let that property fall into such disrepair should be a crime. I recall crossing that bridge during the National Meet in 1982. Here is a link to the Hemmings Daily coverage of the Packard Plant bridge collapse. Several years ago I wrote a story for The Packard Club (in their Packard Cormorant magazine) about a drive along Grand Boulevard–back when it really was grand. Back when Packard was still making cars in the Grand Boulevard plant. I said that for Detroiters back then, it was almost like partaking of a sacrament or rite of passage to drive under the Packard Bridge. And it was. My story about the Packard plant as I remembered it from my youth in Detroit, ended with a statement. In that statement I said that the mere thought of the Packard Bridge soon being gone would bring a stinging tear to my eyes. Some were quick to point out, that the bridge was still standing. But the wrapping of the bridge was just that. A false facade… a mask to fool the eyes into thinking the rotted ugliness underneath did not exist. Meanwhile. the bridge continued to deteriorate. And no one did anything about it, despite two entities who very well could have jointly saved this world landmark. Wishing about the bridge did zero to repair it. And the wrap just told people what they wanted to hear. It had nothing at all to do with reality. The present statements that "the city is taking the lead in clearing debris and providing safety" are clear evidence of the moronic stupidity and greed that created this situation in the first place. The people running Detroit ought to be ashamed rather than boasting of taking any kind of "lead." Taking the "lead" would have meant getting a structural engineer in there YEARS ago and making a deal to sell the entire bridge, if not the south end of the complex rather than to let it all sit and rot over some imagined great fortune to come. SHAME ON THE CITY GOVERNMENT. SHAME! The years have continued to click by and all of the stories about the comeback of the plant and renovation of the property and glowing reports of new tenants and re-purposing have come to… well I think you can see for yourselves. 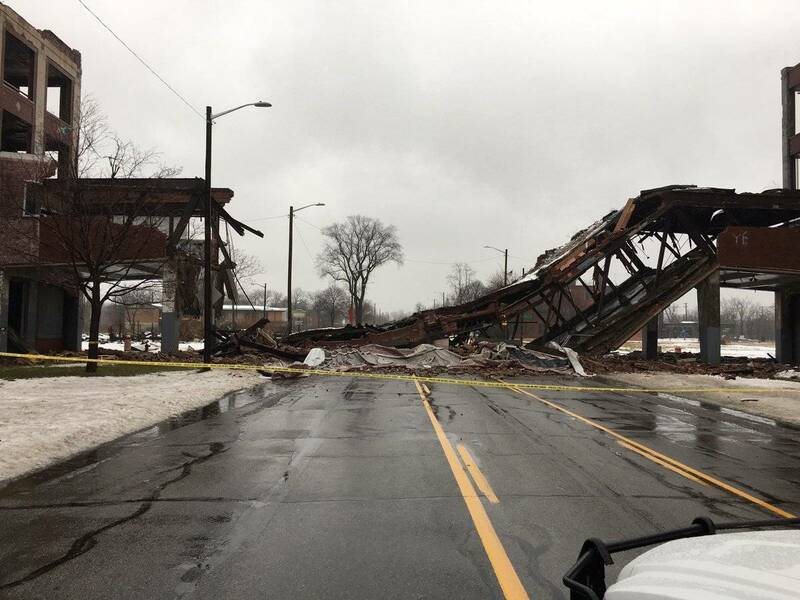 And now, as I feared, the magnificent Packard Bridge… an icon of old Detroit and the glory years of the American automotive industry is indeed gone. And I assure you… there ARE indeed stinging tears in my eyes. One wonders if the split ownership (title dispute?) of the bridge contributed to it's decay and ultimate failure. Or if the failure was end result of the steel scavengers who ravaged the site for years. That's unfortunate. I've never had a chance to visit Detroit and see what remains of the plant, but hope to someday. According to Hemmings, the new owner wants to rebuild the bridge. I guess we'll see what happens. Very say day for Packard lovers and Detroiters. The last real recognizable section of the landmark is gone now. I think the last real preservation efforts for the old plant are finally gone. I think its time to raze the rest of the structures and be done with it. Atleast the proving grounds are there to focus our efforts on. The article that Leeedy wrote is in The Packard Cormorant, Winter 2009 – Number #137. The entire issue was all about the Detroit Factory at 1580 East Grand Boulevard. Leeedy’s article was the lead-off piece on page 3. At the 2013 PAC National Leeedy reprised this article and led a bus tour following EGB from Belle Isle to the PMCC and beyond. IMPO, the bridge came down from neglect. Some mention the recent cold weather we’ve had the last few days. Well, it was the weather of the last few decades that did it in. Palazuelo owned the building on the north side of EGB and the City owned the building on the south side – they shared ownership of the bridge. When the City sold the tax-foreclosed parcels in 2013 to Palazuelo it did NOT include all of the parcels once owned by the PMCC – again, only the foreclosed parcels. Palazuelo says he has been working with the City trying to acquire all the parcels and now claims the City has been slow to respond to his inquiries. Given the history of incompetence in the City, then I would tend to believe Fernando. How can you work on restoring half a bridge when the other side won’t cooperate? 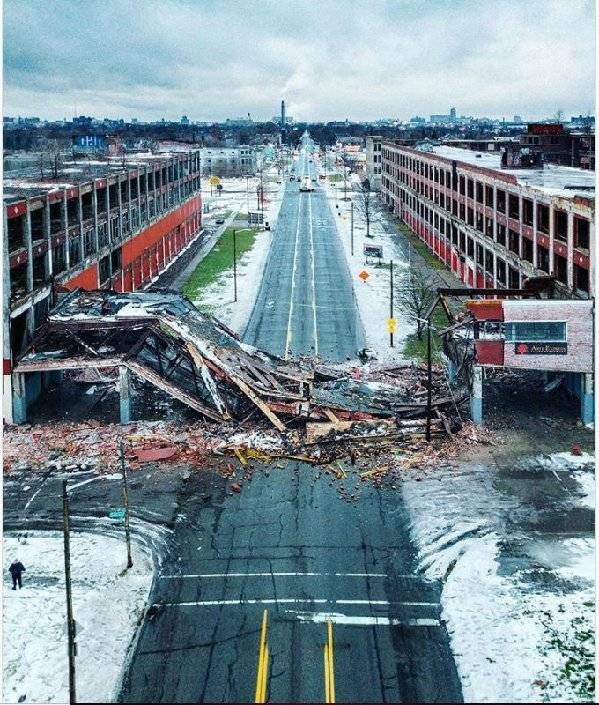 • Why was the city so interested in the Packard plant property? • What was the danger that necessitated a round-the-clock police presence? • And why did city officials continue trying to demolish the plant's buildings, despite a court order to stop? Owen: The steel scrapping had nothing to do with this. They never touched the bridge and Palazuelo had guards in place the last five years. Kevin: Hard to replace a bridge when you only own half of it – the city holds the other half of the answer. 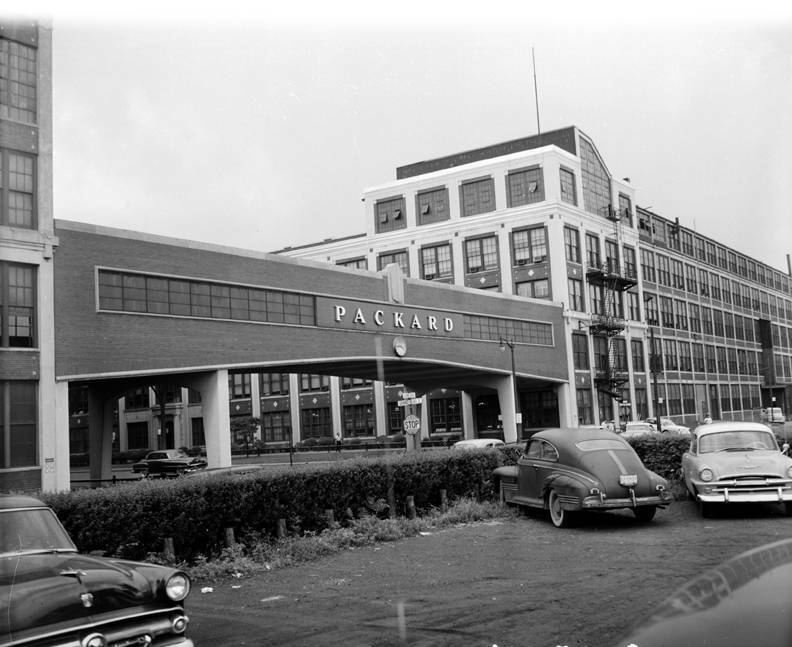 Come to Detroit, there is still the Packard Proving Grounds to visit and a whole host of other auto history sites. Photo below is looking west down East Grand Boulevard toward downtown. It is sad to see. It was on my bucket list to visit the plant in the next year or so. On a different note, I would think a fundraiser of sorts could be made. I would buy an "Authenticated" brick from that plant. It may not make millions but maybe the PPG could use the funds? Just a thought. The biggest lie I tell myself is, "I don't need to write that down, I'll remember it."